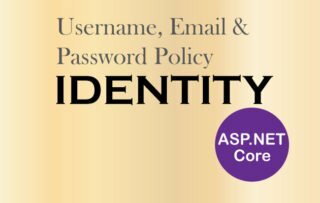 If you want to add more information to the Users in Identity System then you can do this by adding Custom User Properties to the User class (i.e. which inherit from the IdentityUser parent class). 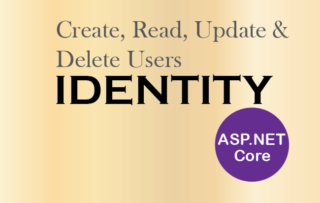 In my previous tutorial on Create, Read, Update & Delete users in Identity Membership System I created the User class which does not have any custom property. Now in this tutorial I will teach you how to add new properties to the User class. The Country Properties is of an Enum type, the Age property is of type int, and lastly the Salary property is of type string. I have also made the Salary property as a required one. Now with the properties in place I will need to update my Identity Database. For this I will have to run the Entity Framework Migration commands. 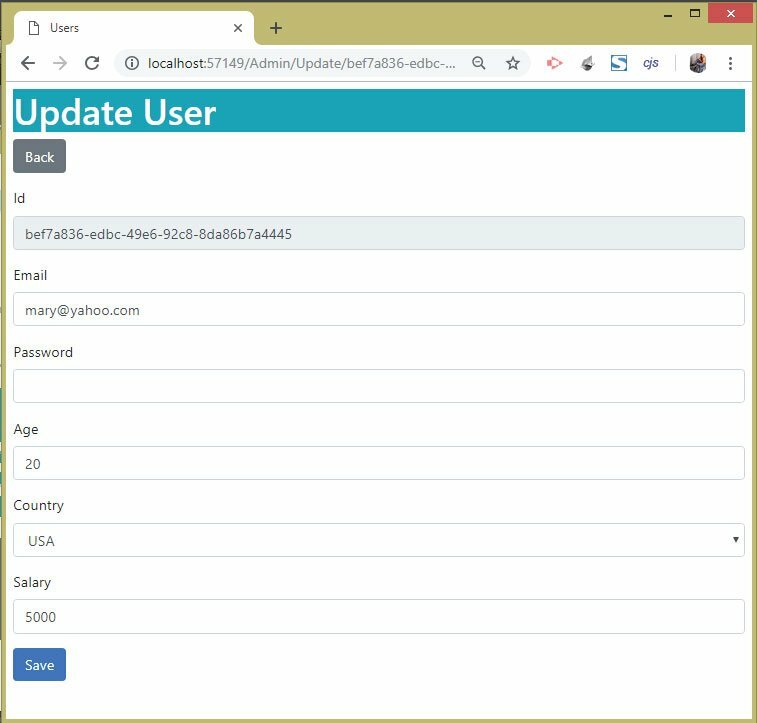 When the commands complete, the table in the Identity Database, that stores user data will contain 3 new columns that represent the custom properties. 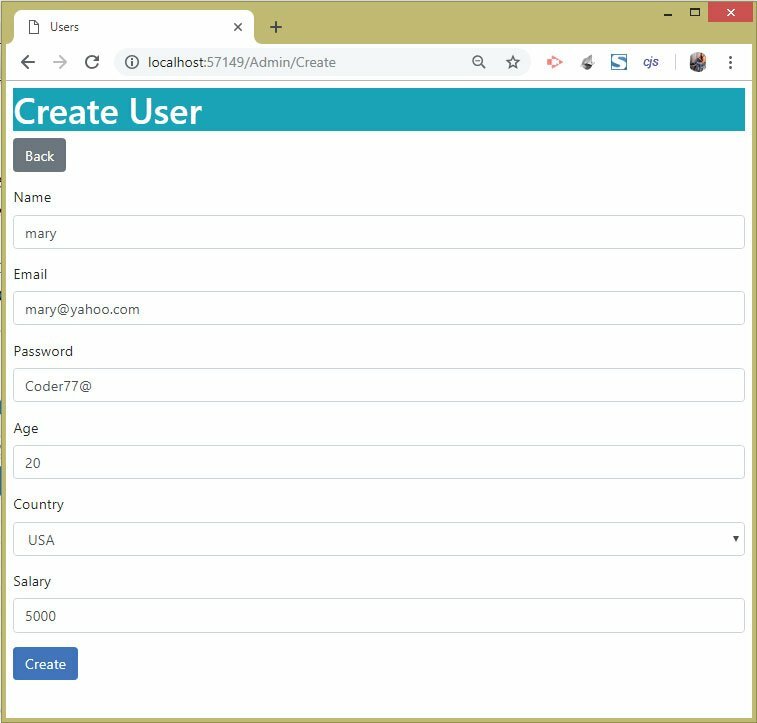 Now I will update the Create and Update User Action methods, of my ‘Admin’ Controller, to add the support for the Custom Properties that I have added. Next, I have to add 3 new controls for these properties in the ‘Create’ and ‘Update’ Views, of the ‘/Views/Admin’ folder. I will use the input control for the Age and Salary properties, and for the Salary property I will use the select control. Finally, I will update the Create and Update action methods of the Admin controller. 2. Setting the values of these 3 new properties of the AppUser class object. 3. Checking if salary value is ‘not null or empty’, in the if condition. To test these newly added Custom User Properties, run your project. This completes the tutorial on Custom User Properties in Identity. Now you can easily add new properties to the User Class based on your requirements. Next Tutorial – How to work with Claims in Identity Membership System.